My last blog post, Friday, March 21, featured a sample paper draft that I composed as a model for my students. The draft included lines for a script selected from an academic essay on Sherman Alexie’s short story collection The Lone Ranger and Tonto Fistfight in Heaven and its film adaptation Smoke Signals. As a model for their collaborative revisions, I revised my script to include lines from an interview with Alexie and lines spoken by his characters Victor Arnold and Thomas Builds-the Fire. And to tie the parts together, I added myself as a moderator. Similarly—but collaboratively, in groups of four and five—my students will fashion their individual drafts into one-act plays, placing their sources in conversation. The setting for my sample revision, which follows, is the Coeur d’Alene Reservation in Idaho, where Thomas Builds-the-Fire, Victor Joseph, Gordon E. Slethaug, and I sit atop the KREZ weather van. Sherman Alexie: A poet and fiction writer who grew up on the Spokane Indian Reservation in Northeastern Washington State. His books include the short story collection The Lone Ranger and Tonto Fistfight in Heaven (1993), which he adapted for the screen. Smoke Signals, the film adaptation, received both the Audience Award and the Filmmakers Trophy at the Sundance Film Festival in 1998. More recently, his semi-autobiographical novel The Absolutely True Diary of a Part-time Indian (2007) received the National Book Award for Young Adult Literature. 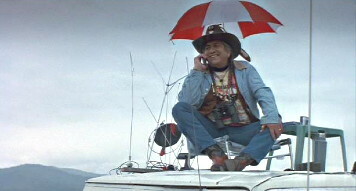 Victor Joseph: The central character in The Lone Ranger and Tonto Fistfight in Heaven and Smoke Signals. Jane Lucas: An Adjunct Assistant Professor at Lenoir-Rhyne University, who along with her students is studying Sherman Alexie’s short story “This is What it Means to Say Phoenix, Arizona” (from The Lone Ranger and Tonto Fistfight in Heaven) and Smoke Signals in conjunction with Alexie’s appearance as part of the University’s Visiting Writers Series. Gordon E. Slethaug: An American-Canadian Professor of English at the University of Southern Denmark and author of Teaching Abroad: International Education and the Cross-cultural Classroom (2007), Beautiful Chaos: Chaos Theory and Metachaotics in Recent American Fiction (2000), and The Play of the Double in Postmodern American Fiction (1993). He also co-authored Understanding John Barth (1990) with Stan Fogel. At the Coeur d’Alene Indian Reservation in Idaho, Thomas Builds-the-Fire, Victor Joseph, Jane Lucas, and Gordon E. Slethaug sit atop the KREZ weather van, which has been stationed at the crossroads since it broke down there in 1972. Oddly, tribal meteorologist Lester Fallsapart is nowhere in sight. Jane Lucas picks up his red- and white-striped umbrella and looks it over a moment before she speaks. Jane Lucas: First, I’d like to thank Randy Peone, the voice of Coeur d’Alene’s KREZ, for letting me meet with you atop the weather van. I was hoping Lester Fallsaparts would be here—isn’t he always here, like the weather?—and Sherman Alexie should be here, too. Alexie’s running late, it seems, but we should get started. As someone who’s studying “This is What it Means to Say Phoenix, Arizona” and Smoke Signals, I’m interested in the differences between the two. Gordon, you’ve written of the “different perception” (131) of the film. Gordon E. Slethaug: Yes, it “presents a different perception from the short story collection [. . .] the short fiction gives a comprehensive representation of the entire Spokane reservation community and includes a typically Alexie critical and cynical view of the systemic problems of unemployment, poverty, hunger, inadequate housing, violence, drugs, alcoholism, and premature death in a culture removed from its traditional moorings” (131). JL: Aren’t many of those problems that you mentioned apparent in the film as well? GS: Yes, but “the film presents a warm-hearted, compassionate view of Victor and Thomas through the medium of the road narrative and engages the audience on the level of humor and sentiment even while it gently critiques white society and racist treatments of Native Americans” (131). JL: It’s an engaging road-trip story, alright, but I’m not so sure about what you call the gentle critique. Some of the characters’ exchanges on screen are less gentle than their counterparts on the page. For example, Victor, there’s what you say on the bus to Cathy, the gymnast, who was an alternate for the 1980 US Olympic Team. Victor Joseph: Yeah, I was just thinking about that. In the short story, our conversation with Cathy ends with that line of yours, Thomas. What is it you say? Thomas Builds-the-Fire: (Opening his eyes) “Sounds like you all got a lot in common with Indians” (67). JL: That isn’t what I’d call gentle. Sherman Alexie: Sorry I’m late—flight delay from Seattle. So it goes. JL: Sherman, you said in an interview that you “didn’t have any problems with mutating [your] own book” (qtd. in West and West). SA: (Nodding in agreement) “Right from the get-go, I said, ‘OK, Sherman you’re going to do composite characters, compress time, take bits and pieces from stories you need for this screenplay, and you’re not going to care.’ The narrative integrity of any one story was never the point, it was all about taking situations from the twenty-two short stories—it actually ended up being adapted from four short stories—taking the best you can find in this book to make it a screenplay” (qtd. in West and West). JL: So the changes you made were your answer to the question, how can this story work best on the screen? SA: Yes, “I’ve always separated them [books and movies] as two very distinct art forms” (qtd. in West and West). JL: I wish we had more time, Sherman, but I know you’re heading to Albuquerque for a reading at the University of New Mexico, and I need to get back to Lenoir-Rhyne. I’ll leave a tape of our conversation for Randy Peone. Whether it airs on KREZ or not, I have a feeling that our words here today will become one of those stories told by you-know-who. TB: Sometimes it’s a good day to die, and sometimes it’s a good day to write a one-act play. Alexie, Sherman. “This is What it Means to Say Phoenix, Arizona.” The Lone Ranger and Tonto Fistfight in Heaven. 1993. New York: HarperPerrenial, 1994. 59-75. Print. Slethaug, Gordon E. “Hurricanes and Fires: Chaotics in Sherman Alexie’s Smoke Signals and The Lone Ranger and Tonto Fistfight in Heaven.” Literature and Film Quarterly 31.2 (2003): 130-40. Academic Search Complete. Web. 17 Mar. 2014. Smoke Signals. Dir. Chris Eyre. Perf. Adam Beach and Evan Adams. Miramax, 1998. DVD. West, Dennis, and Joan M. West. “Sending Cinematic Smoke Signals: An Interview with Sherman Alexie.” Cineaste 23.4 (1998). Academic Search Complete. Web. 19 Mar. 2014.